Sebastian Vettel is the defending Formula 1 world champ. You could argue that makes him the best race driver in the world. But as we all know, skill alone means squat in a game of Mario Kart. 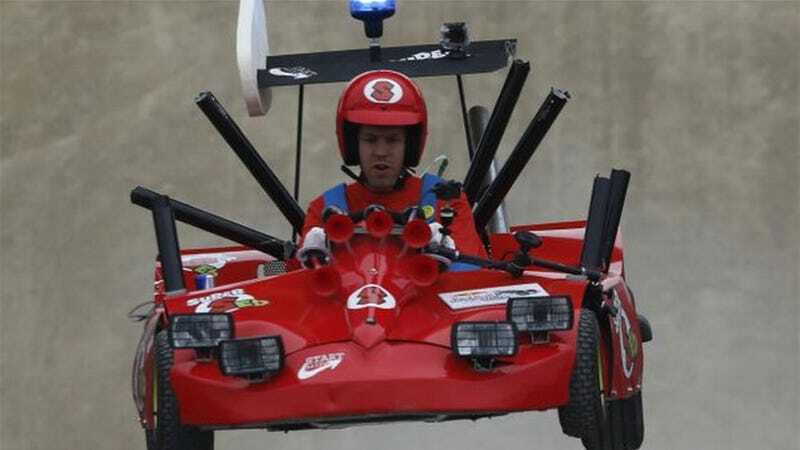 Vettel took part in the German edition of the Red Bull Soapbox Race over the weekend, dressed as Mario and in a red cart that looked as close to Mario's racer as it could without klaxons sounding inside Nintendo's legal department. Sadly, his fake moustache didn't survive the trip down the hill, but both car and driver reached the finish line safely (though the car did lose some parts when it made a rough landing). Guess there weren't enough banana peels on the track. Next year, German crowds, try harder. You can catch some video of the run below.